Rocky road has been an easy recipe I have made for years. My favourite version includes peanut butter, but there are so many options of things to include or how to do it. My favourite recipe is below, but I'll share peanut free variations at the end too. Rock road is basically melted chocolate mixed with marshmallows and whatever else you want then left in the fridge to set. 2 - 3 Tablespoons of peanut butter. I prefer crunchy but my kids like smooth. This one ingredient has had so many people ask for my recipe. It is optional though. - Melt the chocolate in 30 second burst in the microwave. It usually takes 1 - 2 minutes if using chocolate melts or chips. - Push evenly into a slice tray and place it in the fridge to set. 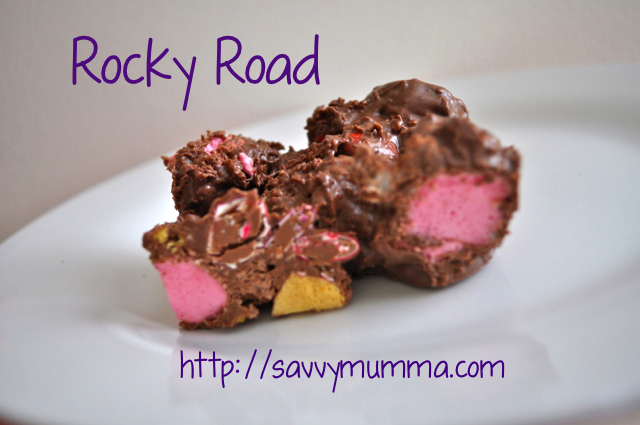 How do you like rocky road?